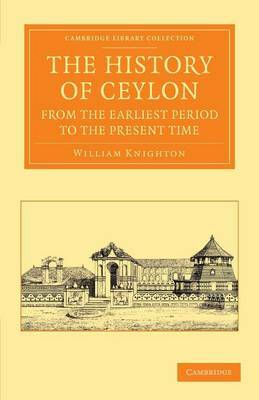 William Knighton (d.1900) published this history of Ceylon (present-day Sri Lanka) in 1845. He spent most of his career there and in India, and published a number of vivid accounts of his experiences. This book surveys the ancient past of the island up to Knighton's own day, covering its many rulers and invaders as well as its shifting eras of unity and fracture into competing kingdoms. It gives an account of the first settlement, the establishment of Buddhism, the growth of the ancient capital Anuradhapura, the reign of Queen Anula (the first female ruler in Asia), the emergence of early Christianity, the development of the caste system, the medieval wars after the forming of the Jaffna Kingdom, the arrival of the Portuguese, the Dutch, and later the British invasion. Covering law, agriculture, arts, religion and language, this learned work remains relevant to students of Sri Lankan history and culture.